NES Double Dragon II: The Revenge (USA) "2 players" in 08:21.61 by xipo. 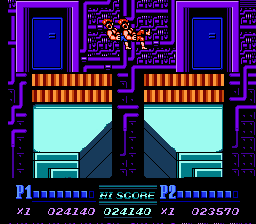 Double Dragon 2 (1989) is a beat'em-up game that shows the true value of teamwork. Despite sibling rivalry, Billy and Jimmy help expedite their common goal with well-timed knees to each other's faces. This new version by xipo is 18.51 seconds faster than the previous effort by adelikat. Most of the improvement came from better application of glitches. If you're more a fan of runs where one macho man defeats an entire gang alone, there is also a one-player run available.